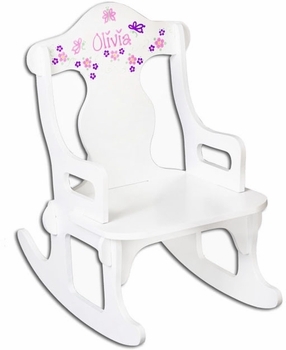 This cute baby rocker comes with the baby’s name artfully imprinted on the backrest with your choice of 65 unique designs! Made of solid wood and painted in satin white, it is 23 inches high, 15 inches wide and 13 1/2 inches deep. This adorable rocking chair is perfectly sized for all children ages 1-6! Crafted of solid Canadian maple. Tool-less assembly allows rocker to be easily disassembled for storage or travel. All paint is certified lead free. Note: Children under 2 yrs. should have adult supervision.